For many of Boone County’s law enforcement officers, 2018 has been a tough year. In March, the Boone County Sheriff’s Office lost one of its own when Deputy Jacob Pickett was gunned down in Lebanon while pursuing a criminal on foot. Pickett, a 34-year-old Zionsville resident, was the first officer in the county to be killed in the line of duty since 1935. For Pickett’s family and co-workers, the wounds are still fresh. Since March, the community has mourned him and held several fundraisers to support his family. Public Information Officer Chris Burcham said there have been other recent tragedies across Boone County, including a double-murder suicide in Zionsville Sept. 21. “The hits just keep coming this year,” Burcham said. 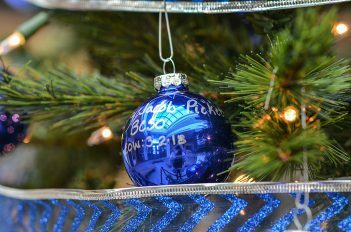 Dispatch Officer Lydia Edwards, seeking a way to remember Pickett during the holidays, was inspired when she read about a police department in Texas that used tree ornaments to honor fallen officers. She said she felt the BCSO could do something similar. The 9 1/2-foot tree features 145 ornaments, one for every American law enforcement officer killed in the line of duty in 2018. Each ornament has the officer’s name, rank and end of watch date, hand-written by BCSO staff members. When the tree was first erected in early December, there were 137 ornaments. Eight officers have been added to the list in less than one month. Chaplain Andrew Ramey said the tree is a symbol of hope. Once the tree was up, community members began taking notice. After receiving media coverage on Fox News, the tree drew national attention. A Dec. 13 Facebook post made by Fox News contains a video about the tree. It has more than 177,000 views. The post also was shared by Franklin Graham, son of evangelist Billy Graham, and received more than 63,000 Facebook likes, comments and shares. The office received numerous emails, texts and phone calls thanking it for honoring officers and receives approximately two requests per day from police departments nationwide, requesting photos of their fallen officers’ ornaments. The BCSO plans to mail the ornaments to their respective police departments at the end of the year. The holidays were not the only reminders of sacrifice. Pickett’s birthday, Dec. 20, was quietly celebrated at the BSCO. Since his death, the BCSO has continued to honor Pickett. There are photos, plaques and a special ornament hanging in the office. 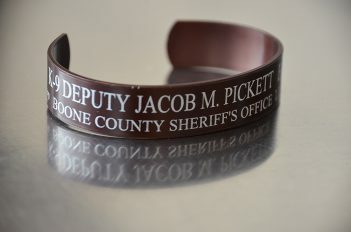 Several BCSO employees wear engraved metal bands in remembrance of their former co-worker. Some have tattoos in remembrance. In May, Pickett’s wife Jen Pickett and other family members will attend National Police Week in Washington, D.C., where Pickett’s name will be added to the National Police Memorial. The week, designed to help families navigate loss, honors law enforcement with a candlelight vigil and memorial service. Activities and workshops for family members also are offered. Money raised during an Oct. 6 polo match at Zionsville’s Hickory Hall Polo Club will pay for the Pickett family to participate in National Police Week activities. The match, organized by Megan Cantrell, raised $17,000. Michelle Atkinson, a close friend of the family, said Boone County Sheriff Mike Nielsen, as well as Pickett’s family and friends, hope co-workers can attend the D.C. memorial as well. 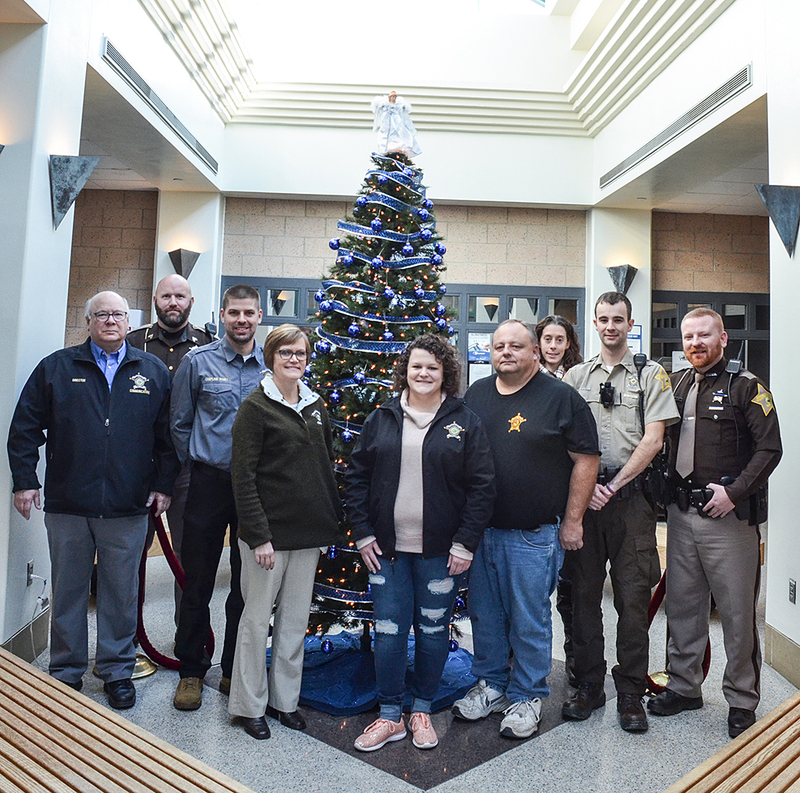 With help from Jen and other friends, Atkinson launched the Sponsor a Deputy fundraiser, which aims to raise $20,000 to help fund the BCSO’s efforts to send as many staff members as possible to the event. The estimated cost is $1,000 per person. A Facebook fundraiser raised more than $4,000. “There are a lot of people who worked alongside Jake that would love to be there,” Atkinson said. State troopers and other outside officers plan to aid the BCSO by covering the officers and staff members’ shifts during the event. The fundraiser will continue through May. To contribute, visit paypal.me/BCSOk9donationfund or mail a check to BCSO, 1905 Indianapolis Ave., Lebanon IN 46052.